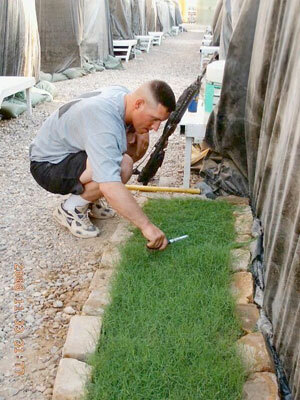 Here is a soldier stationed in Iraq, stationed in a big sand box. He asked his wife to send him dirt (U.S. soil), fertilizer and some grass seeds so he can have the sweet aroma and feel the grass grow beneath his feet. If you notice, he is even cutting the grass with a pair of a scissors. Sometimes we are in such a hurry that we don't stop and think about the little things that we take for granted.